Like the impatient blogger I am I have been DYING to share this post for over 6 months now, ever since we began planning our kitchen diner makeover – and finally, IT'S HERE! My dream kitchen makeover and everything that happened in between. I can't quite believe I'm sitting here typing this. It's honestly everything I could have ever wanted in a kitchen. It's warm, inviting, simple, farmhousey, homely and so 'us' it's unreal. Come on inside and I'll stick the kettle on! 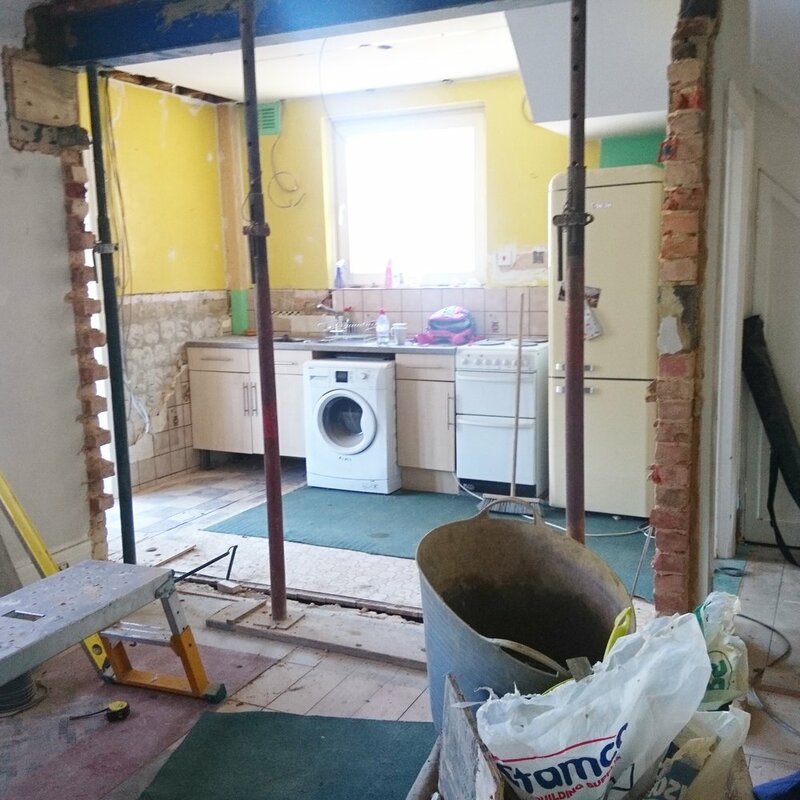 You can see from the floor plans that we knocked down a dividing wall between the old kitchen and dining room. The new kitchen has been fitted where our dining room once was, and our old kitchen is now one open space with a big farmhouse table and chairs. The double doors that once led out to the sunroom have been blocked to install a window above the sink, and the sun room is now a utility/bootroom. Have you spotted the psychedelic carpet yet? yep. This was the original kitchen we inherited when we moved in. It was actually in great condition. The previous homeowner had only recently installed it, but none of it to our taste. The room was a typical galley layout (long and narrow) making it tiny and impossible to be in with 2 people cooking and washing up. We knew the only way to make the footprint of the kitchen bigger was by knocking through to the dining room and swapping the rooms around to maximise cupboard and worktop space. It meant that we'd lose a dining room but I prefer open-plan living so I wasn't phased. Every single wall and ceiling in the house had wallpaper on it when we moved in (sometimes as much as 2 or 3 layers), and weeks on end were spent removing it, ripping up carpets and removing heavy storage heaters before work could begin. I couldn't believe how fast it all happened initially. The day the wall was knocked down (something I was SO excited about, and will never forget!) I had to leave the house because I could barely see my hand in front of my face for all the dust it left. God, I will not miss the dust! We have the best builders who are trusted family friends and that made the whole project so much more fun – laughs a plenty every day and they completely understood the challenges of living and cooking in the space while work was happening. They kept it as clean as possible for us and I really can't thank them enough. Beejay Builders is the name! if you're local to Brighton, UK, drop me an email or instagram message for their details if you'd like them. I recorded pretty much all of our progress shots on my instagram and will be doing the same for our bathroom renovation when it starts in the new year so please do follow me on there if you like watching rooms evolve :) You can also read this post to see what it was like 4 weeks in when the kitchen started to be fitted. And here she is. Our beautiful new kitchen! So happy with it. Our kitchen is the Howdens Fairford range in Cashmere, with solid oak block 40mm worktops. We chose to buy it from Howdens simply because we owned a Howdens kitchen in our previous flat which was great quality, I really liked the shaker designs Howdens supply, their design process was so thorough and flexible, and the whole kitchen came in on budget so it was decided. Read my post How to design and order a new kitchen and why we're opting for Howdens if you're still curious. I did consider an Ikea kitchen but changed my mind and later found out that builders often refuse to fit ikea kitchens because EVERYTHING is flat packed – no surprises there. With Howdens (and other kitchen suppliers I'm sure) carcasses (i.e the white units that make up your kitchen) arrive assembled, making it less time to fit which costs you less money in labour. You might think you make a saving on Ikea kitchens, but you'll spend the money you saved on the extra time spent fitting it, so I'm glad I changed my mind so early on. We had a reasonable but still pretty tight budget for all this work so inevitably hours of research went into even the smallest details like the skirting boards, because I knew we didn't have a lot of money to play with. I'm going to share an in-depth shopping guide in a few weeks time so that if you're renovating, you can find out exactly which suppliers we went with and why. Something we have always wanted since the day we moved in is to open the front door and be able to have a long view like this straight out onto the garden. We made sure internal doors were all made of glass for this reason alone, and it's allowed light to flow throw the house really well. Our initial, much grander plans were to open up and extend the whole back of the house which would have made the kitchen so much brighter than it is. We got estimates in to have large roof windows installed in the extension to allow light to flood in and views of the sky (estimates from companies like Roof Windows, just in case you're looking for that sort of thing) but quickly we realised the project would take us not double, but TRIPLE over the budget we had. So that dream was zapped pretty quickly. Read more about our reasons for scaling back our project here. I love how our flooring (by Quick Step) runs throughout the whole ground floor. We wanted unity throughout the rooms, and it was Neil's idea to have the same flooring throughout to achieve this. I think it works really well – well done Neil :) I'm particularly happy with this flooring because besides it looking beautiful (and almost like real wood, it's laminate!) it's also an extremely durable and practical solution. The flooring was laid before work had finished so it was refreshing to be able to relax knowing it could withstand knocks and bumps from workmen's boots and plasterwork. Here's a closer view of our new door which we had custom made and painted by Bereco. It is absolutely solid, safe and triple glazed, which was really important to us because we needed to heat the house efficiently, making sure we weren't losing heat out through the sun room/utility room (it was deathly cold in there during winter months before we renovated everything). I initially struggled to find suitable windows and doors to suit the era of our house and the shaker look I wanted, until I found Bereco. So happy I did find them as the door and window which you can see in the next pic down tie the whole look together. Read more in my post on ordering our windows and doors. Our house has never had a central heating system – we installed a boiler and heating system this time last year. This is a large open space that needed 2 heaters minimum; one to heat the dining area and one to heat the kitchen, so to keep with the period look we chose this beautiful column radiator from Plumb Nation for the dining area and a kick space heater by Smiths under the kitchen cabinets (exact one HERE - it’s the perfect solution when you have no walls to hang a heater on in a space!). You can see it just below the pan drawers in the pic below. A genuine dream of mine and Neil's (he does most of the cooking!) was to have a double oven similar to one his Mum and Dad has (a rangemaster), with a shelf above it for me to style up seasonally. The shelf we installed was made bespoke for us by a lovely local carpenter who lives about 5 mins up the road that I met on Instagram – thank you Luc! We also commissioned him to make our farmhouse table and bench, see pics of it below. There are very similar options on Etsy, built bespoke for your home at such cheap prices - Similar shelf HERE, and a gorgeous peg rail version HERE, I also modelled our table on THIS farmhouse table available on Etsy, again, so affordable when you shop around). I wanted the cooker to be the focal point in the kitchen and I love our how Rangemaster Kitchener 90 from My Range Cooker fits snug inside the old chimney breast leaving room for my shelf above. It's a dream to cook with, as are my beautiful new pans from ProCook. IN LOVE WITH MY MURMUR LIVING TABLEWARE YOU CAN SEE HANGING OUT IN THIS PIC. THAT JUG GIVES ME HEART EYES! Neil and I did all of the decorating ourselves to save money and not hold up the project. The colour scheme we used was actually a recommended scheme I saw on the Farrow & Ball website. Super easy. I knew I wanted the softness of Farrow & Ball's Bone on all of the woodwork (it's the colour we had in our old flat) but I didn't know what colours to put with it that complimented both the flooring and kitchen units. So I clicked on the F&B site and saw that the recommended colours to pair with Bone. They recommended Slipper Satin and Lime White. It was sorted, that's what I lead with. The walls are Farrow & Ball's Slipper Satin but colour matched with Valspar paint from B&Q. I adore working with Valspar paints and regularly hop between theirs and Farrow & Ball's paints throughout the whole house. I chose Valspar for the walls because they specifically stock paint that's mixed specially for kitchens plus it's that bit cheaper than F&B paint. The woodwork we used Farrow & Ball paint for. Honestly, I don't normally have the table dressed with plates and flowers but with tableware this gorgeous I couldn't not! I am loving Murmur's Northern Irish table linens and wares at the moment. They stock some timeless fabrics for any occasion and I'll be using these for gatherings we have planned in the new year. We had a bit of a faff trying to decide what to do with this opening when it was actually built though because we wanted to include a wine rack but didn't want to shell out ££'s for a bespoke made one. As the Chief Wine Connoisseur of the house I got Neil to assess our options. He did some research and found a company called BottleBlock who make stackable blocks, no glue, no nails required, just blocks of wood that you slot in place to create this bespoke beehive look wine rack which can be changed, removed or repositioned later down the line (if you gave up alcohol perhaps!) It saved us so much money as we thought we'd have to get a wine rack made up at the risk of not liking it or it not fitting. We are delighted with how this turned out. Confession! Our kitchen tiles were about the only thing that we chose really last minute on a trip to our local Topps Tiles store in Lewes. We went in there to order our gorgeous stone floor for the utility room (sneak peek on my instagram) and came out with the car full of these beautiful Artisau Gloss tiles in White for the kitchen (similar option HERE). I am thrilled with the way they suit the room given it was such a last minute thing. The light grey gunmetal grout we went for will make it much easier to keep the tiles clean in the high traffic cooking/washing up areas too. STILL HAVE TO GET A BLIND FOR THIS WINDOW – CONSIDERING MAKING MY OWN, EEEK! Getting our double belfast sink from Tap Warehouse installed fulfilled another kitchen dream of mine. I'm the girl who types into the Pinterest search bar "belfast sink" and just scrolls through hundreds of pics on a weekly basis! Seriously! In my eyes, no farmhouse-esque kitchen would be complete without one, and every time I'm washing the dishes in it – OK it's rare, we have a dishwasher for the first time now, but still – I just stare at it in disbelief and feel so happy we chose this over a normal silver or white ceramic sink. The joy it brings me is a bit ridiculous. It's just a sink, Fiona!! This room comes into it's own when the family is over and chilling around the table waiting for us to serve up the food. It's going to be especially nice this Christmas because it's the first time my Nan can come for Christmas Day without having to worry about climbing lots of stairs. We usually host Christmas at my ma's down the road from us, she lives in the first floor flat where I grew up and my Nan often worries about the stairs. It's going to be brilliant spending it all together worry-free. Some favourite accessories in here is my Weaver Green rug which you can see poking out below the breakfast bar there, my wicker basket from Rose and Grey and my butter dish there on the counter, which was a gift from Neil's Mum and Dad. By the way, in case anyone has noticed, it appears as though we are 3 chairs short around the dining table – and good spot, yes we are! – Our lazy bones got the better of us the day the chairs arrived from Next. We assembled one which took AGES and then they sat in cardboard boxes for a week before we bothered to assemble more. Sorry! I'm sure there'll be plenty of opportunities to photograph them again soon. This is one of my favourite corners of the house now. I like to think of it as my 'lucky' corner with the horse shoe that my ma bought me when we visited my twin bro in Belfast, and the number 2 (my lucky number) that Neil bought for us originally for a gallery wall we have yet to put up in our living room. The frames are from Rose and Grey and are pretty perfect for magpies like me who sees a new print they love and wants it on the wall asap. These frames are so easy to change up as they open up like doors. You can slot things into the glass and change them regularly. Neil came up with the idea to put tongue and groove circling the farmhouse table and I instantly loved it. It brings a shaker / farmhouse vibe to the room and is so much more interesting to look at than if we were to have kept it as an average wall. The skirting boards for the house we always pick up from the Skirting Board Shop online. They have speedy delivery and a good selection. Here's me hoping we'll spend many many happy years together cooking for family, friends and each other in this space. It was a labour of love, but absolutely worth every tear shed. A huge thanks to all of the people and brands mentioned in this post too, some of which gifted us products for the project. If you're renovating soon, please do sign up to my mailing list and I'll email you when I write the suppliers/shopping post for this project. It will save you lots of time searching for the best and most affordable things – we've been there and it took us aaaages! Download the budget planner that we used to successfully navigate our entire refurbishment! This post contains some gifted products and some affiliate links but all reviews are my own. I only ever feature companies I have approached, have bought from in the past and highly recommend. Our couple plans for Christmas!